Another one from the Banstead County Secondary School archive… this time from April 1960, when a group of boys visited the Rhineland for a week. They were based in Königswinter, south of Cologne, and made trips from there to Bonn (then the capital of what was West Germany), Rüdesheim, the Mosel Valley, the Laacher See, the Eifel Mountains and the Nürburgring motor racing circuit. 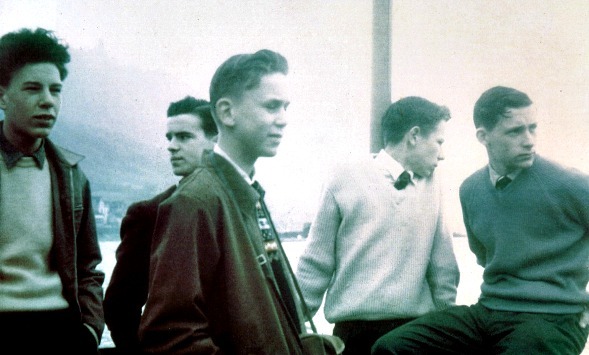 This rather faded colour photograph shows some of the boys on a Rhine ferry – from l to r Martyn Walls, Peter Denton, Martin Maclean, John Griston and Derek Ford.